“Strike of the Black Mamba” is now available as an Amazon.com Kindle e-book here: http://www.amazon.com/dp/B003VYBITE. If you don’t have a Kindle e-book reader yet, you can always download the free Kindle software to be able to read Kindle e-books on your PC or laptop computer. Strike of the Black Mamba Now Available as an E-book! My thriller novel “Strike of the Black Mamba” has now been published by CruGuru as an e-book in both PDF and Microsoft Reader formats. The ISBN for the PDF version is 9781920265342 and for the Microsoft Reader version is 9781920265359. The novel is sold via most large online e-book retailers, such as Diesel eBooks, ereadable, Powell’s Books, BooksOnBoard, eBooks About Everything!, eChapterOne.com, etc. Continue reading Strike of the Black Mamba Now Available as an E-book! The TV interview with SABC News International was quite an interesting experience. It was a quick affair, about five minutes in total, sandwiched between news items. They did not brief me beforehand about the questions I could expect, but it was more or less the standard book interview – although I was asked to give my views on nuclear terrorism. I did a lot of research for the book, so it did not catch me off-guard. 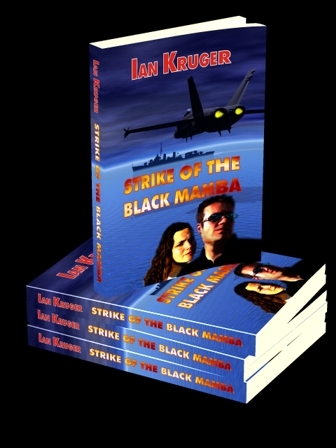 I’ve been invited for a TV interview about my thriller novel “Strike of the Black Mamba” tomorrow morning (18 May 2008) between 07:30 and 09:00 South African time (about GMT + 2 hours) on SABC International. It is on The Weekender Show’s book slot. The station transmits to the U.S, most of the African continent, parts of Europe and Asia. Finally my debut thriller novel, “Strike of the Black Mamba”, is available on Amazon.com. Please take a look at my Amazon book page and if you do read the book and like it, I would really appreciate if you could write a review on Amazon for it! Continue reading Amazon, here we are!